Bolivia's lithium reserves are underneath the ethereal beauty of the Salar de Uyuni. Bolivia is determined to extract the lithium so that this beauty is preserved, and so that the benefit remains in Bolivian hands, specifically, in Bolivian Indian hands. Good luck to them. 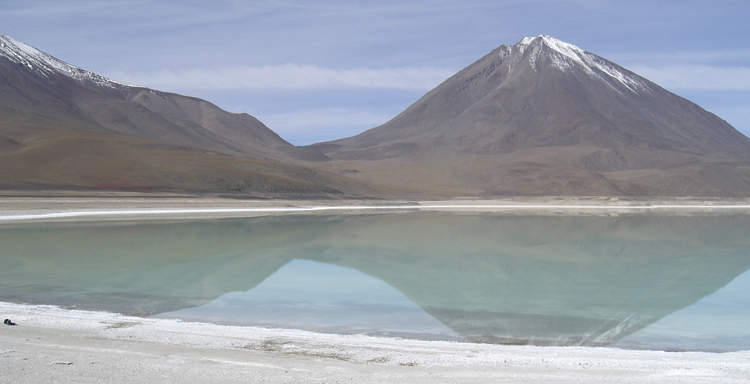 The new natural resource boom is going to happen in Bolivia, which has half the world’s known reserves of Lithium. In the wake of the global financial crisis, the rises and falls of the volatile oil market, and the lack of new oil sources in North America, new forms of energy and energy storage are being sought, far from the instabilities of the Middle East. The US car industry, under pressure from falling sales of gas guzzlers and the Obama administration’s push for more fuel-efficient vehicles, is finally taking seriously the idea of making mass-market electric cars. And this means Lithium demand will rise. Why Lithium? Lithium is the lightest solid element, and is a strongly alkali metal. It has a high electrochemical potential, giving a lithium battery cell a voltage of 3V, double that of a conventional battery. This combined with lithium’s low density gives a very high energy to weight ratio, and is thus of intense interest to the automotive industry. Electric cars have to carry their energy with them in the form of batteries. Lightweight high energy batteries are the holy grail of the industry, and lithium is slated to be the answer. Lithium is already in use in the batteries of laptop computers and mobile phones, where energy capacity and weight are also major factors. General Motors has developed the hybrid Volt which runs on batteries first, then a petrol-powered generator cuts in and supplies electricity after the first 40 miles or so. GM believes that the vast majority of journeys are completed within 40 miles. Toyota’s mass market conventional hybrid Prius, after losing money for years, has now paid off handsomely, and Toyota’s electrical knowledge is now being deployed more widely: the Lexus range has several hybrid models. Mercedes is testing an electric version of its Smart, while BMW is doing the same with its Mini, the BBC reports. Nissan-Renault, Mitsubishi and VW are all developing lithium batteries. And all-electric cars are no longer slow and heavy clunkers. Tesla’s Roadster, yours for USD100k, does 0 to 100km/h in 3.9 seconds, leaving Ferraris and Lamborghinis in the dust, and has a range of 390km on a single charge. Look out for their USD50k saloon next year. So if all these new vehicles will be deploying Lithium batteries, where is the Lithium to come from? New reserves are being found all the time: known reserves tripled between 1976 and 2008, according to the US National Research Council, which believes that concerns regarding the availability of the element are unfounded. Nevertheless, actually getting Lithium out of the ground is the tricky bit, and this is where the huge reserves in Bolivia may come in handy. About 50 per cent of the world’s reserves lie under the mountainous Bolivian area Salar de Uyuni, in the heart of the Andes, in rocks and salt water. Currently, Chile and Argentina supply the vast majority of the world’s lithium to the world - approximately 70 per cent. When Bolivia’s industry gets off the ground, it may open the country up to enormous wealth, as well as under-cutting the industry of its South American cousins. Bolivia is not the easiest country to do business with. Its government is suspicious of foreigners and foreign investment – its colonial and post-colonial past provide support for this attitude: the country has failed to prosper despite decades of mineral exploitation. The government believes that the mostly foreign concerns that extracted Bolivia’s mineral wealth enriched themselves while impoverishing Bolivia. Nevertheless, foreign capital will be needed if these vast reserves are to be extracted. The Salar de Uyuni are colossal salt flats, and present a most spectacular sight. The Bolivian Government is determined to preserve the salt flats and is insisting that any extraction plan includes provision for maintaining the pristine and ethereal beauty of the area, while providing the lion’s share of the profits for Bolivia and the Bolivian people. In reality, this may prove just too hard a nut to crack: other reserves are available; Lithium isn’t a consumable like oil – it is recyclable; other reserves are more readily exploitable without causing environmental damage; other reserves don’t include dealing with Bolivia’s difficult government. But any attention paid to this spectacular part of the Andes will reveal the extraordinary beauty of the area – perhaps the world should let this sleeping Lithium lie.